For years Canadian Real Estate has been the unstoppable engine propelling the economy forward. The little engine that could, along with the finance and insurance sector managed to contribute 23% of GDP in 2017. 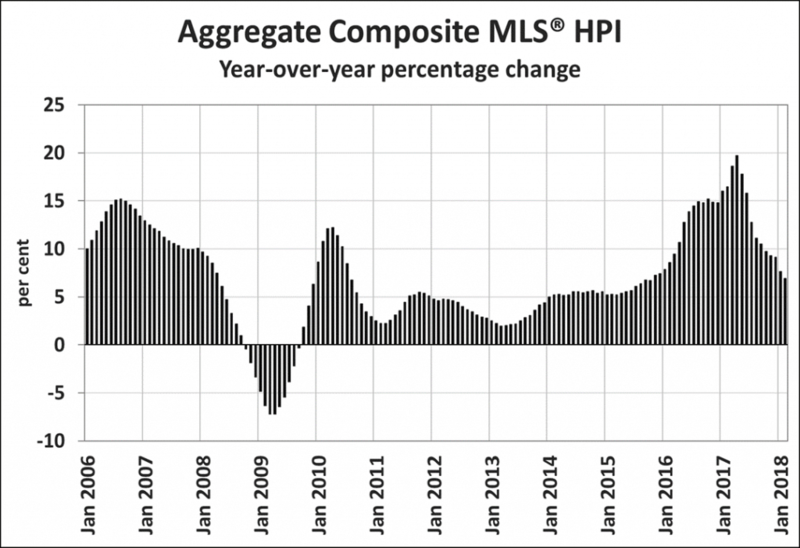 The resulting housing boom has inflated national home prices by 49.68% in just five years per the MLS home price index. However, recent data from the Canadian Real Estate Association suggests the party may be coming to an end. National home sales fell by 16.9% year over year in February. 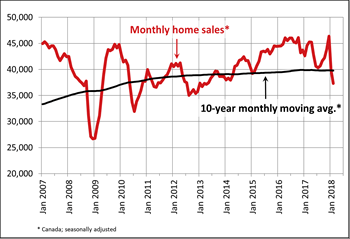 The decline marked a five year low in activity for the month of February and pushed sales 7% below the ten year average. Price growth appears to be tapering on a national level, despite new listings sinking 6.4% below the ten year average. The Aggregate MLS benchmark price increased by 6.9% year over year in February 2018, the smallest year over year gain since October 2015. It also marked the tenth consecutive deceleration in year over year gains, continuing a trend that began last spring.